A, B, C, D, E, F, G and H are sitting around a square table in such a way that four of them sit at four corners of the square while fore sit in the middle of each of the four sides. The ones who sit at the four corners face the centre while those who sit in the middle of the sides face outside. Two females sit in the middle of the sides and two at the corners. A sits second to the left of G. G sits in the middle of one of the sides. C sits fourth to the right of his wife and his wife is not an immediate neighbour of A or G. B sits third to right of her husband. B does not sit at any of the corners. 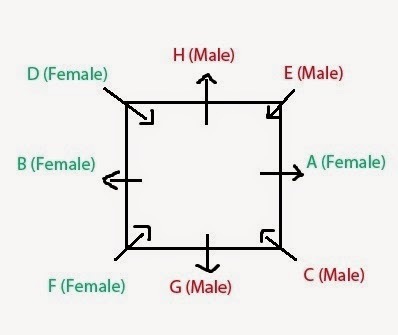 Only D sits between B and H. H is husband of A. E is a male. 1. Which of the following is true with respect to given seating arrangement? a) No two males are immediate neighbours of each other. b) G and H face each other in the seating arrangement. c) A sits in the centre of one of the sides of the square table. d) F is a male and sits diagonally opposite to E.
e) E and D are immediate neighbours of each other. 2. Who amongst the following is B’s husband? 3. How many people sit between B and C when counted in anti- clock wise direction from B ? 4. Who amongst the following is the wife of C? 5. What is the position of E with respect to C? They are sitting diagonally opposite to each other facing center. thank you DJA these examples improve my knowledge, selection of one proper sentence as reference and moving with other parts...improves getting an right answer...but its take time of 14 to 17 min...is there any quicker approach to solve such advance level problems???? Based on B position we can decide E position. since B sits third to the right of her husband. Already mention dat E is Male. It took me 20 mins to understand and solve. It is hard to figure out where to start and how to map. Is it simply trying my best to understand the reasoning or there any better approach to this. Please explain. Thanks. First I want to know this, are you having trouble only with Seating arrangement or entire Reasoning section? or else you can Name the topic and I will gladly help you. Give some tips regarding seating arrangement difficult one !! How you got exact position of 'B', I am getting two position of 'B' while solving it. Please explain? As you see last two lines in question gives maximum info about B. If you get E's position correctly then you will get B.
I don't have to say All the best to you coz you can get it done. hi i would like to have your help for solving questions of number serires and odd one out kind of question. I would definitely help you. Hi, Im confused with one point. If "A sits second to the left of G." then how A sits second to the right of G in answered diagram?. Remember always see from its angle not from yours. Still got doubts comment here...I will explain it no matter how many times it be. I'm Sorry I didn't get what you are asking, are you asking me to provide explanation for the above or tips to solve quickly? I'm facing too much problem solving these types of questions how to solve please tell me. How come F became female there was no condition about it.... I am confused a little i got the diagram right just could not understand that. C sits fourth to the right of his wife and his wife is not an immediate neighbour of A or G.Does it implies that A or G cant be the wife of C? I am getting two wives for C.
great help i must say..!! Just remember one thing (not related to your doubt, common thing in seating arrangement) if a puzzle or a sitting arrangement is tough means there will be definitely a guessing part takes a main role at some point you have to make a decision considering all given hints. What is your confusion Munna? Thank you DreamJob Adda. The practice sets are very helpful. Good set of questions.. Definitely helpful.. Many Thanks..
Good set of questions.. Definitely helpful.. Thanks, Dream Job Adda.It is very helpful.